In a large bowl, mix all the ingredients but the Egg Replacer and Chocolate Chips. Blend with a hand mixer for about 3 minutes. Then, add Egg Replacer and blend for another minute. 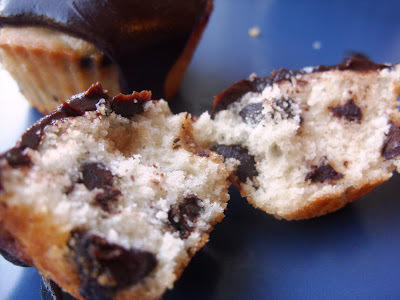 Fold the Chocolate Chips into the batter. Now, I made a dozen regular sized cupcakes, and 40 mini-cupcakes. I really like the little cupcakes with my coffee in the morning and they're easy to hand out to friends, loved ones... whoever. So if you're like me, spray your mini-cupcake pan with the Baking Spray, as well as the inside of 12 silicone baking cups. Put the baking cups in the regular-sized cupcake pan. With a soup ladle, fill the mini-cupcake pan cups and the silicone baking cups half-way. You may want to keep an eye on those Chocolate Chips to make sure every cupcake gets some. They tend to bunch a bit. Then, bake till they're golden on top and you can insert a bamboo skewer in the top and remove it cleanly. Remove them from the pans and let cool on a rack. You may want to let the regular- sized ones cool a bit in the baking cups so you don't burn your hands. Now, while those cool... we make the Ganache Frosting! Now grab your sweetest little saucepan; you know, that little one that looks like it was meant for a doll house. If you don't have a tiny one, use a regular-sized saucepan; just watch out for scorching, because the glaze will be spread out thinner. Toss in all the ingredients, and stir while they melt. Once they're melted and blended, put the whisk attachments on your hand mixer and blend them again for about 30 seconds. You're almost done! All that's left to do is to frost the cupcakes. Take your cupcakes and dip the tops in the Ganache. YUM! * If you're interested in other Agatha updates: She is currently asleep on my desk on her pillow. ** I intended to post something here about Spike from Buffy, but I had to dig through too many homemade tribute music videos to try to find the clip I wanted, and seriously. there's a limit to how much Godmack and Evanescence I can listen to. But you all probably have enough nerd-cred to insert your own favorite Spike clip here mentally. Make it so! I can't wait to try these cupcakes. I recently developed a recipe for ganache that is healthy, and also the best I've ever tasted (If I do say so myself) using coconut milk.